I recently joined a Clean Eating Facebook group started by my friend Samantha (find her blog here!). There are about a dozen of us, and we share our “clean” meals and snacks, hold each other accountable, and swap recipes and ideas. Sam has inspired me to make a post about clean eating, which is absolutely, 100% the ONLY “diet” (I cringe to even call it that) I can get behind. I feel super good when I eat this way. Simple. I have more energy, I don’t get as hungry, and I don’t get that “nasty” feeling after eating a huge meal. I look super good when I eat this way. Less acne, glowing skin, and less fat, straight up. It’s also a great way to eat when you’re trying to build muscle. It’s simple. I don’t have to count calories or measure my food… I simply have to eat… simply. Real food that comes from the ground, not a factory or laboratory. So basically, for those of you who don’t know, “Clean Eating” refers to eating food in its most natural form. Another way to put it is “being mindful of the food’s pathway between its origin and your plate” (Fitness Magazine). Today I had an awesome clean lunch that I wanted to share with you! All hail the power of eggs and their unending versatility! 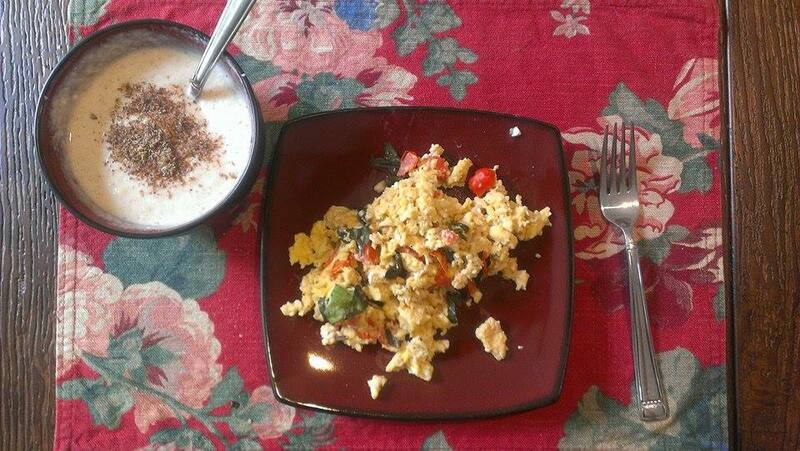 The main course: The Caprese Scramble. Heat a small skillet to medium-low and spray with PAM. Chop up some cherry tomatoes and throw those suckers in the pan. Toss ’em around a little. When you feel that your tomatoes are nicely warmed (a minute or so), pour the eggs over them. When the eggs are about cooked, toss in some chopped basil and mozzarella. The side dish was something of an experiment, but dang, it worked: Apple Pie Porridge (because I couldn’t think of a better name). Add honey and cinnamon to taste. Top with some ground flaxseeds. Eat and revel in the dessert you have just created! Do you have any favorite clean eating recipes or tips? Don’t be stingy, share them below! Does sound good! And not too hard for those on a morning get-to-work deadline!